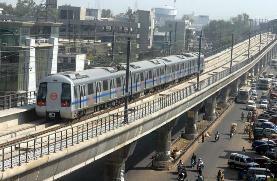 Gurgaon: A Metro line connecting Huda City Centre to Gurgaon railway station has been proposed by a local MLA office to the Haryana Urban Development Authority (HUDA), which is said to be working on the suggestion. The proposal, which was made after conducting a survey a week earlier, broadly outlines the number of station with their names and areas to be catered. The routes have been proposed along the New Railway Road up to Rajiv Chowk at Delhi-Gurgaon Expressway and further up to Subhash Chowk at Sohna Road finally merging into the Delhi Metro line at Huda City Centre near Fortis hospital. “Yes, it is true that the metro connectivity between the above said two destinations that have the maximum passenger pulling strength is required urgently and at the earliest. It will help nearly three to five lakh commuters daily. We have held a meeting with the chief administrator, Brijender Singh, and other officials in this regard,” said Umesh Aggarwal, Gurgaon’s MLA. The plan to connect the above said two destinations by a metro network via Rajiv Chowk and Subhash Chowk will be around 12 km. Connecting Gurgaon railway station with Huda City Centre by another line of metro is deemed as an urgent requirement to bring parity in terms of Metro facility for commuters of old and new Gurgaon. “Shortly, the HUDA will invite reputed companies to prepare detailed project report. We want work to begin at the earliest,” added the MLA. However, despite several and repeated attempts chief administrator Brijender Singh could not be contacted. That this line will be in addition to already proposed 11.5 km metro extension line between Sector 21 Metro station and the Iffco Chowk Metro station in Gurgaon for what Detailed Project Report is being prepared by the Delhi Metro Rail Corporation. plz also publish the future of metro project , in next 5 years, in gugaon on map.